Man I hope so. This t-shirt weather is starting to get old... FAST! i have fished it in open water but never ice. how would you get it to it in the winter? As Fishforpike stated there is some current and not the best access across to the pond. If you know one of the club members you can get on at there trail. ITs upstream of Newton Falls. Oops. I did mean to write "upstream". Haha, I meant no disrespect. Yeah I've made gumbo's and stuff out of those Y boned fellas it's just I'm usually so wrapped up with walleye during the ice season that I never target northerns. But who knows, if the perch and walleye bite dramatically slows down around here I might have to go try my luck for a few trophy's. My experience with Cole's Creek and Brandy Brook are that are busy on weekends. I stay away unless I can take time during the week. I have enough other/better places to go that I just don't bother too often. Black Lake, I can help you with. Here's a google map with LOTS of notes. Check it out and ask away. Public access is limited and there are a few "unadvertised" spots you can get on at. The only public spots are the state boat launch and at Rollaway Bay, off the end of the town road. Be prepared to walk or have some sort of transportation. Also, ask before you go to a chosen spot - there are areas of current and unapparent danger. Send me a PM any time and I'll do my best to help out. I'd like to pick away at you're expierience on the black this year if time and money allow Phil . there is some great hidden crappie ponds in the Adirondacks. you are within 20 miles of some of my favorite crappie waters. ive caught them 14 inches or so inside the blue line. i know of a couple but never had any good luck at them, maybe we can share some knowledge? Looking forward to fishing Black Lake for some crappies. Haven't fished it sense the mid 80s and never through the ice. I have never been lost, just a bit confused for a few days ! Not like there used to be, there isn't. Frankly, a bunch of St Lawrence county locals (read that as scumbags) ignored limits back in the mid 90's and took as many as they could catch in a day, every day for as long as they were biting. Personally, they should have shot the entire lot of them because they absolutely ruined Mile Arm Bay, both for number of fish AND access to the ice....old Smitty gave me a key to his road back years ago and told me if I ever left the gate open when he had it closed I could forget about fishing there again. Those "guys" are still at it. and still ruining access to the lake. Anyways - there's more to it than the guys taking fish out. Lots of other environmental factors are at play. It's not just Black Lake either. While on the topic of Black Lake....my question is who regulates derbies on the lake. I was in the barber shop today and already see signs posted for an upcoming derby. Last year local companies were holding employee and guest derbies and every weekend it seemed as if there was a derby of some sort. My suggestion would be to limit the smaller derbies on the lake and bring more publicity to the larger ones with more money making potential. What are others thoughts on this? No one regulates derbies on the lake. That would take; near an act of "god". New "Special Regulation" by DEC. Anyways - beyond that, you are referring to the small "derbies" ? I don't think there is much you can do to stop someone from having a private, little, fishing get together. By the way, you are most welcome to our club and to help organize and work out our fishing derby event. Ahhhhhhhhh, nypike, I still owe you!!!! You sir helped to create one of my GREATEST ICE FISHING MOMENTS of my life! Yes I am planning on making a trip up that way for sure this year! Also once the Ice is solid in Massena on the St. Lawrence I will if you want take you to a spot I have for Walleye and Perch and the occassional MONSTER Musky. Glad to see you back at the Shanty for another year! HERE IS A REMINDER OF THE DAY YOU HELPED TO CREATE! always here to help and would love to meet up on st lawrence sometime, i fish it but am always just takin a shot in the dark as where to go. definately would help to go with someone with knowledge of the river and places to fish. OH YA! How do I go about getting one of those. Nice Tiger. Whitehouse Bay = crappie in the stumps. Pike halfway out and possible walleye out near the mouth. You can get there from the Waddington Beach Road as well. Need 4-wheel-Drive to cross the fields there. joey, your covering alot of water, what town are you living in ? And on a side note I would not go near hogansburgh to ice fish or fish at all. Been fishing Henderson, Red Lake, Black Lake, St. Lawrence and especially Butterfield for quite a while on Soft water. Looking to find a few guys with some more experience on some new spots. Draw back to having me along is that I am a week-end or holiday Walker, dragging my gear sled. Usually fish five tip-ups while sitting on a jigging hole. I do have a buddy that I fish with on Perch Lake, but looks like he will be away a lot this season. First day fishing last year was 01 JAN. Can't wait to get out this year as the boat got put up at the end of October and I am going stir crazy in anticipation. I mostly get perch, pike and pickerel...occasional crappy. Would love to haul some walleye up through a hole. I have no electronics so pick my spots based on Hydro maps and looking at the shore, or leaked intel (gossip)...no complaints on how I have been doing so far. Hope to upgrade next year to a shelter as a minimum but would really like to get an ATV and a MarCum showdown ice troller to open up my opportunities. Not happening this year unless I win the lottery! Last year I fished fathead minnows on the tip ups and jigged with a Swedish pimple also with a fathead. I am looking for as much advise as people are willing to give on techniques or bait selection...If I can pry your jaw open with a nice cigar and you spill some details on hot locations...its all good. Never can figure out while folks are so tight-lipped. I'm not going to crowd you, but I sure might fish "your spot" if you are not there. 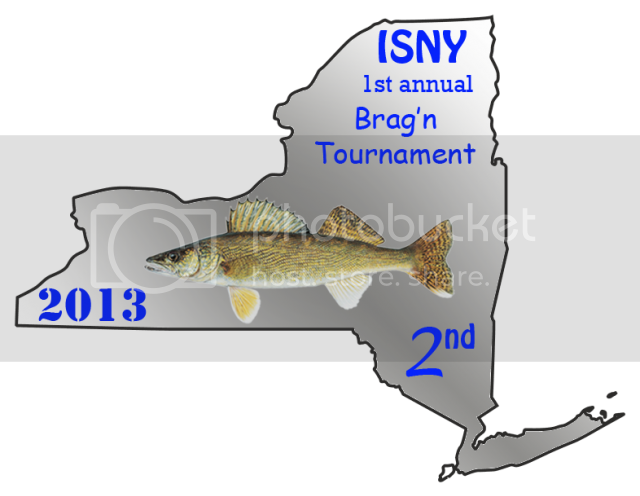 Signed up for the on-line tourny again this year as I enjoyed the fun and pics from last year. Too many places to try and fish and not enough week-ends to fish them!! aren't the eyes last ice ? along with mud bay ? Theyll be biting as early as Feb 1st in some spots, and that's during daylight hours....night fishing is planned also this year. joey, your covering a lot of water, what town are you living in ? And on a side note I would not go near hogansburgh to ice fish or fish at all. I'm in Massena, ha ha yeah I was BS'ing the other day with someone and he was telling me that Hogansburg might not be the smartest thing to do this winter... Yeah this St. Lawrence thing is a bit tricky to scout because I just don't know where the safe areas are other then what I hear or guess at not to mention how maps are inaccurate depth wise due to Montreal's need to flood their canals. I don't really want to venture past Ogdensburg too often this winter but if I have to in order to avoid heavy crowds or better fishing so be it but most of my ice fishing is going to be during the week so we'll see. I have a lot to learn up here that's for sure. I've ice fished the last 15 years mostly on Chautauqua Lake south of Buffalo and swimbaits are god on that lake for the eye's. As for here I've heard everything being used under the sun from jigging bucktails to solely relying on tip-ups. It doesn't seem like any one strategy is head n shoulders above the rest here where in Oneida pimples rule the water. It's a good thing though because on those lakes you get so fixated on pimples and rapalas that you rarely try out new/other presentations. Here I honestly don't know anything about walleye fishing and am going to throw everything I have at them and in situations like the one I'm in I thank god I have a vexilar that's going to really help me figure out these Walters!